What is a Winnebago ERA? Era, Winnebago RV: The original luxury Touring Coach holds a Mercedes-Benz® diesel engine designed with the power and torque you need for your next great adventure. Continuous track lighting, new cabinetry (70M), and a fresh galley design make for a pleasant cooking and dining experience. 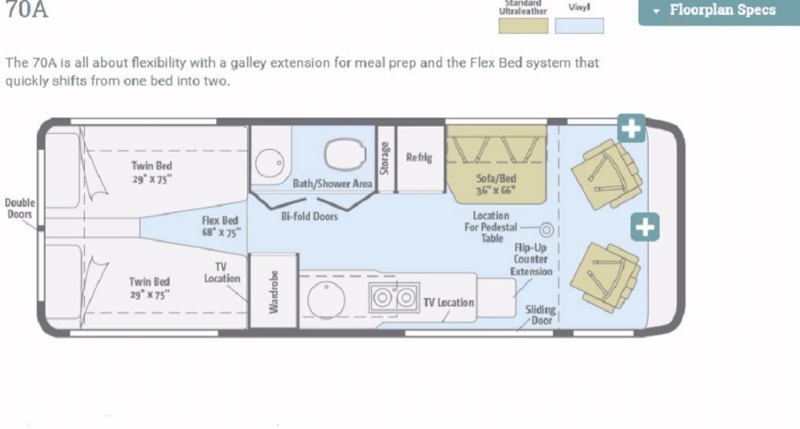 Three distinct floorplans offer three unique sleeping arrangements, from the Murphy+ Bed in the 70M, to the rear sofa/bed in the 70X, and to the versatile Flex Bed System in the 70A. Of course, a powerful air conditioning system comes standard, but for those days when you just want a cool breeze, the large rear double doors with a sliding screen door (70A, 70X) can't be beat. Welcome the era of freedom and mobility: the Winnebago® Era®. 2019 Winnebago Touring Coach Era **FOUR WHEEL DRIVE** 70A 24ft Mercedes Turbo Diesel Sprinter ***MSRP is $167,029.00 ***Our Discounted Price is $123,990*** Mercedes Sprinter Chassis with Dual Rear Wheels, 3.0 Liter V-6 Turbo Diesel with 325 Ft/Lbs of Torque, 5 Speed Automatic Transmission with Tip-Shift (Allows Manual Shifting for the Hills), 4 Wheel Anti-lock Braking, Alcoa Wheels, Driver and Passenger Airbags, Color Rear Camera, Onan 2.5kw Micro-Quiet Generator, Roof and Dash Air, Dual AGM Coach Batteries, New Popular Floorplan with Larger Galley, Companion Seat w/Swivel and Slide, Rear Flex Bed Offers Convertible Twin Beds To Queen Bed and HD Flatscreen TV, Private Full Bath, Nice Kitchen with Expandable Solid Surface Corian Countertop, 2 Burner Recessed Stove, Stainless Steel Sink With Glass Cover, High Pointe Microwave Oven and Nice Stainless Steel Like 2 Door Refrigerator /Freezer, Tinted Coach Windows, MCD Roller Privacy Shades, Truma Tankless Water/Coach Heating System, Multiplex Dimmable Lighting with Touchscreen Master Control Panel, Ultra-Leather Swivel/Recline Captains Chairs that Rotate to Function as Coach Seating, Touchscreen Infotainment Center with AM/FM/GPS/DVD/CD/iPhone/SiriusXM Ready, Power Windows, Door Locks and Mirrors, Power Patio Awning with Integrated Led Lighting, Rear Slide Out Storage Tray, 5k Tow Package, ***MSRP is $167,029.00 ***Our Discounted Price is $123,990***Brand New and Just Arrived, Other Models Available and More Arriving Soon, Custom Orders Available, Conejo Wholesale Auto & RV ~ Exclusive Winnebago Touring Coach Era Dealer for Ventura County, The Era is a Must See Coach that Costs Thousands less than Roadtrek, Leisure Travel Vans or Sportsmobile, 661 E. Thousand Oaks Blvd, Thousand Oaks, CA 91360, 805-496-8700, Open 7 Days, 9am to 6pm, Come Experience the No Pressure Sales Approach at Conejo RV, We Also Buy Clean Late Model Coaches (***plus tax & license fees***) 1 Year Camping Membership Included In Purchase Ask For Details! You might like these other Winnebago RVs. 2019 Winnebago Era 70A, Winnebago Era class B diesel motorhome 70A highlights: Double Twin (Flex Bed 68" x 75") Wet Bath Ultraleather Furnishings LED Lighting Exterior Speakers Hit the road and enjoy traveling knowing you have everything you need to be comfortable. No late nights with zero motel vacancies to get you down. When you are ready to stop for the night in this Era class B diesel coach you can be assured a comfortable stay no matter where you choose. There is seating up front for three with the captain's chairs swiveled around. A wet bath allows you to get cleaned up and feel refreshed any day while on the road. Enjoy the two twin beds in back that are each 29" x 75", or using the Flex bed system put them together and create a 68" x 75" bed for a bit more room. A two burner cook-top, single bowl sink, and double door 6 cu. ft. refrigerator will assure that you don't spend a single night hungry. With the amenities provided you can easily whip up a light meal or snack anytime you like. And, when you decide to stay for awhile, put out the powered awning for a bit of outdoor living space to enjoy as well! In any Winnebago Era class B diesel touring coach you will find a variety of seating, sleeping, bathing, and cooking options depending on the model you select. Built on the Mercedes-Benz Sprinter chassis you can be assured a powerful and fuel efficient vehicle for a variety of travel needs. The contemporary styled interior with Ultraleather furnishings not only looks good, but feels good too! You will enjoy stainless steel appliances along with a compressor driven refrigerator for the best cooling performance possible. LED lighting is available both inside and also under the powered patio awning so you have the perfect task lighting for any activity day or night. And, for those of you that like to go off-grid for awhile, the expandable solar power system and 2,500 watt Onan MicroQuiet LP generator allows you to camp just about anywhere in complete comfort and style! 2019 Winnebago Era 70B, Winnebago Era class B diesel motorhome 70B highlights: Movable Pedestal Table Ultra Leather Furnishings LED Lighting Stainless Steel Appliances Power Awning w/LED Lights Exterior Speakers You will love the versatility of this Winnebago Era class B diesel coach. It is perfect for dashing across town, or for a weekend get-a-way. You will find all of the basic amenities inside to keep you comfortable while you travel. There is seating for three up front when you swivel the two front ultraleather captain's chairs around and include the third seat behind the passenger side. A moveable pedestal table can be used in front or added to the rear of the coach for dining. You will have the convenience of a wet bath, and a kitchenette including a three burner cook-top plus single bowl sink. In the back, enjoy a sofa that converts to a 70" x 80" bed at night with plenty of storage for your things throughout! You are sure to appreciate the powered patio awning for those warm sunny days to create a shady spot outside to enjoy! In any Winnebago Era class B diesel touring coach you will find a variety of seating, sleeping, bathing, and cooking options depending on the model you select. Built on the Mercedes-Benz Sprinter chassis you can be assured a powerful and fuel efficient vehicle for a variety of travel needs. The contemporary styled interior with Ultraleather furnishings not only looks good, but feels good too! You will enjoy stainless steel appliances along with a compressor driven refrigerator for the best cooling performance possible. LED lighting is available both inside and also under the powered patio awning so you have the perfect task lighting for any activity day or night. And, for those of you that like to go off-grid for awhile, the expandable solar power system and 2,500 watt Onan MicroQuiet LP generator allows you to camp just about anywhere in complete comfort and style! 2019 Winnebago Era 70A, 2019 Winnebago Era 70A. Twin Beds! Mercedes diesel chassis package, Luggage rack, Exterior ladder, aluminum stylized wheels, Radio/Rearview system, Trim valance. This Sprinter-based B-van keeps getting better. One of the first motorhomes in its class built on the Mercedes-Benz Sprinter chassis, the Winnebago Era launched a whole new “era” of upscale touring that continues to raise the bar. The Era floorplans offers a variety of options, accented by premium contemporary interior styling, sumptuous Ultraleather furnishings, and dimmable LED lighting. Full galleys feature stainless steel appliances and a compressor-powered refrigerator for optimal cooling performance. Outside, a powered patio awning, LED lighting, and exterior speakers make it easy to relax, while the expandable solar power system helps keep the power flowing, even when you’re off the grid. Tour in style and camp in luxury: See the world in your Winnebago Era today! Call 1.888.412.5711 for more information. Trades Welcome. Financing available. Winnebago Motor Homes and Trailer Sales Inc. BRAND NEW!! CLEARANCE!! MUST GO! !The contact for this RV is Jeff Pogue, Kevin Fossum or Eric Bloore and we can be reached at 888-339-9166.The Winnebago reputation for quality and reliability have never been more evident than in the ERA! Their premiere class B motorhome features sleek modern cabinets, lots of accent lighting, and this 170M Floorplan is really unique! It has a slide on the driver’s side! Because of that It has a very comfortable power fold down bed with a mattress, a spacious bathroom in the back with the shower separate from the toilet, a couch when you aren’t sleeping, and a ton of cabinet space! Loaded with the lastest technology at a very reasonable price compared to other brands, the ERA really shines! The Mercedes Sprinter chassis is long-lasting, flexible, safe, and very fuel-efficient! Everything you'd expect from two of the most trusted companies in the RV business! Nothing is keeping you from chasing your dreams in this compact motorhome except your imagination!Out of state customers are welcome! Additional photos, brochure and floor plan available by request. For questions about this RV or unlisted inventory at any of our 4 stores ask for Jeff, Kevin, or Eric in Internet Sales at 888-339-9166 or email us at fvinternetsales@mikethompson.com. Mike Thompson's RV Super Stores is currently the #1 RV dealer in the country. We pay top dollar for all types of trades. Deal directly with the internet/fleet department for no-hassle prices.Due to the nature of this electronic media, errors may occur. The dealer does not accept liability for errors or omissions in the contents of this electronic media. Consumer must confirm price, terms and options before purchasing. Prices stated are net of any manufacturer customer rebates (if applicable). All prices must be approved by a sales manager. Prices shown exclude government fees and taxes, any finance charges, any dealer document preparation charge,any elect transfer/registration charge, any emission testing. Pictures shown may not be of actual unit/when a payment ad is present a FICO score of 740+ is required - score alone does not guarantee loan approval. Ad price is on RV listed in this ad only! Check out the exciting NEW 2018 Winnebago ERA 170M. This Class B motorhome is powered by the Mercedes Benz diesel engine and sits upon the Mercedes chassis giving you exceptional miles per gallon. This New 170M ERA is the first in it's class to offer a slide-out in a Class B motorhome, giving you a sofa in the daytime and "murphy bed" sleeping at night. This unit has an expansive rear bath has all the options: including, Large screen infotainment/GPS monitor, Solar system, stainless steel valances trim, a collissioni avoidance stystem, stylized aluminum wheels, permium speakers and sound, and all of the rest of the standard features that make Winnebago #1 in the Class B market. This unit has an MSRP of $154,567.00. We are a 30+ year Winnebago dealer and will NOT be undersold. We want to earn your business with honesty and exceptional knowledge of the RV lifestyle. Give us a call to see this exciting NEW Winnebago ERA Touring Coach 170M. FeaturesLength 24'3"|Exterior Height 9'10"|Exterior Width 6'4"|Awning Length 13'Interior Height 6'3"|Interior Width 5'10"Freshwater 25 gal|Black 8 gal|Gray 26 gal|Water Heater 6 galLP Capacity 16 gal|Fuel Capacity 26.4 galWheelbase 170"|Seating Capacity 43.0L 6-cylinder, 188-hp, diesel engine, 5-speed automatic Tip Shift transmission, 220-amp. alternator4-wheel ABS brakesTrailer Hitch4 5,000-lb.  drawbar/500-lb. maximum vertical tongue weight | 7-pin wiring connector13,500 BTU low-profile high-efficiency roof air conditioner Truma Combi Eco Plus Heating System w/(2) 850-watt electric heating elementsLiving Area24" HDTV and coach stereo system w/AM/FM radio, Bluetooth, CD/DVD player, alarm clock, remoteJack® Digital HDTV antennaLED ceiling lights w/dimmer switch|MCD blackout roller shades|Tinted coach windowsSoft vinyl ceiling|Powered ventilator fan|Powered roof vent Systems monitor panel|Multiplex wall switches|USB chargerBedroomTwin beds w/Flex Bed System that opens up to a King24" HDTV w/remote|Hanging wardrobe w/drawersCockpitRadio/Rearview Monitor System 6" LCD color touch screen, remote, iPod®/MP3 input, color rear cameraChassis/coach battery radio power switchCab seats armrests, adjustable lumbar support, adjustable headrest, and slide/swivel/reclineDual airbags|Cruise control|Power steering w/tilt wheel|Power mirrors w/defrost and turn signalPower door locks w/remote|Power windows|12-volt powerpointsSunvisors|Pleated, sliding front window blinds|Folding privacy screens for cab door windowsKeyless entry w/remote|Carpet floor mat|Appliqué packageOutsideSide & Rear screen door|Powered patio awning w/LED lighting|Porch light w/interior switchSlideout compartment tray (access from rear door & inside) Running boards, rocker trim w/mud guard|Rear mud guards Speaker system|AC/DC load center/converter|Auxiliary start circuit 2-deep cycle batteries (AGM maintenance free)|Coach battery disconnect system Dual-battery charge system|45-amp. converter/charger|30-amp. power cord Exterior TV jack|Exterior AC receptacles|Exterior DC receptacles2,500-watt Cummins Onan® MicroQuiet™ LP generator Exterior Service Center - city water hookup/tank diverter valve, drainage valves, sewer hose valve and exterior wash station w/pump switchKitchenFlip-up countertop extension|Corian® solid-surface countertop|Microwave oven w/ touch control 2-burner range top w/glass cover|Refrigerator/freezer (w/removable freezer unit) Stainless steel sink w/folding faucet and glass cover|Cold water filtration systemBathroomFlexible showerhead|Shower curtain|Toilet w/foot pedal and sprayer|Tissue holder Stainless steel sink|Wet Bath 24"x43"
2018 Winnebago Era 70M, End of the season blowout special!!! MSRP: $150,228 Savings: $45,233 SALE PRICE: $104,995 Payments From: $554 /mo. This Era class B diesel coach features a spacious rear bath, and a slide out Murphy bed which creates two different layouts depending on the time of day. During daylight hours you can enjoy plenty of seating with the sofa found opposite the door along the road side wall, and the two swivel captain's chairs create a nice conversation area all together. There is also a pedestal table for meal time use. At night, when the sun goes down, you can create sleeping space with a fold down Murphy bed slide that is 52" x 75" and includes overhead storage. There is also additional storage above the cab area as well. To the left of the entry door you will notice the kitchen space including a flip-up counter extension, a three burner range top, and sink. Opposite you will find the refrigerator / freezer, plus storage. Above the stove and sink you will find space for your daily dishes and things making it easy to prepare and cook light meals while you travel. Just beyond the kitchen there is a large wardrobe along the curb side. Next, a sliding door that leads into a spacious rear bath including a shower, toilet, and vanity with sink, plus overhead cabinets, and more. MSRP $147,563, excellent condition, 1-owner clean carfax, 2 keys, under factory warranty plus 5-years good sam extended warranty and tire warranty (transferrable). Numerous options, see window sticker. Heated front seats. Year End Internet Clearance Sale!! !These Special Values are available for a limited time while inventory lasts.Valid for in stock units only.No Dealers Please!Pricing on in Stock Units Only.Call Gunter 949-505-3506MSRP $ 149,297One of the first motorhomes in its class built on the Mercedes-Benz(R) Sprinter chassis, the Winnebago Era(R) launched a whole new era of upscale touring. Now, with an available 4WD option and other enhancements, the Era continues to raise the bar. The four Era floorplans offer a variety of seating, sleeping, bathing, and cooking options, accented by premium contemporary interior styling, sumptuous Ultraleather? furnishings, and dimmable LED lighting. Full galleys feature stainless steel appliances and a compressor-powered refrigerator for optimal cooling performance. Outside, a powered patio awning, LED lighting, and exterior speakers make it easy to relax, while the expandable solar power system helps keep the power flowing, even when you’re off the grid. Tour in style and camp in luxury: see the world in your Winnebago Era.Travel smarter with custom features such as the movable pedestal table for the lounge and rear twin beds featuring the Flex Bed system with deluxe FROLI springs. Head out in this Winnebago Era class B diesel coach and have everything you need at your fingertips! Enter model 70A through the sliding door on the passenger side and find a seating area where the front cab seats can be swiveled around. There is a place for a removable pedestal table between the two, which is the perfect place to enjoy your morning cup of Joe! A 36" x 66" sofa bed for one is found just behind the driver's seat straight across from the curb side sliding door.To the left of the entrance there is a flip-up counter extension, a TV location, a two burner range top with glass cover, and a round sink with overhead storage as well. Opposite the range you will find a refrigerator next to the sofa bed. There is also a small storage cabinet along side.A side bath/shower area is located along the road side behind bi-fold doors and features a toilet and sink. A handy wardrobe for your clothes is located opposite.In the rear find two twin beds that can easily create a larger bed using the Flex Bed system. The twin beds are 29" x 75" and with the Flex Bed insert between you can have a 68" x 75" king size bed. There is also a space for a TV in the bedroom area so you can watch television in bed. The rear double doors make it super easy to load up your thing before heading out to your favorite camping destinations, plus so much more! 2017 ERA Winnebago BM170X. New and very clean. Most sought after model and layout. Only used on 5 trips. 6,600 miles. Mercedes-Benz Sprinter. Mercedes-Benz /V6 Turbocharged, Diesel. 3.0 litres, fuel injected. 188 hp@3,800 RPM. Torque 325 ft-lbs. @ 1,400 RPM 5-speed automatic with overdrive. Towing capacity 5,000 lbs. 2017 Winnebago ERA 170X 9700 miles like new second owner lots of options ac,tv,generator,outside tv hook up with speakers,ton of storage,led Lighting,fridge,tolley self contain ,rear seats out of van never been used still in org packaging ,loaded call for more information ,still under factory warranty all services are up to date. 2015 Winnebago ERA 70C, 2015 Winnebago Era 70C This year, we are proud to introduce the new 70C floorplan featuring a slideout and hydronic heating system for even more indoor enjoyment. The Era returns with its popular Mercedes-Benz® Sprinter chassis, Ultraleather™ swivel cab seats, an available Infotainment Center with Rand McNally RV GPS, MCD blackout roller shades, and upscale Corian® galley countertops. In addition to a full-featured RV experience, this coach comes with impressive fuel efficiency. For versatility and style in an agile ride, choose the Winnebago Touring Coach™ Era.